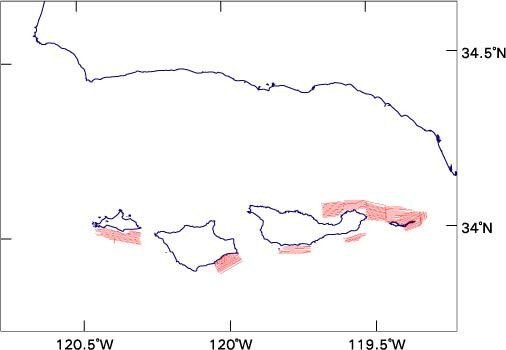 GIS data files that covers the entire northern Channel Islands area are described here. Detailed data sets for each study area are described in the next section. Regional basemap data layers include coastline, bathymetry, sample data, sanctuary boundaries, California State Jurisdiction, and proposed marine protected area boundaries. 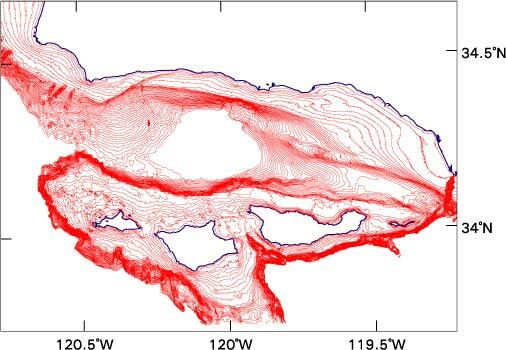 Bathymetry is provided as vector contours with a 10-m depth spacing. Contours with depths greater than 500 m were omitted from the file to reduce file size. Location data in the form of navigation tracklines, composed from one-minute time fixes are provided for the cruises on which data were collected during this project. Data presented in this volume were collected on cruises B-1-98-SC (USGS, 1998), B-1-99-SC (USGS,1999), M-1-00-SC (USGS, 2000). The database "uSSEABED" is an extensive digital compilation of sample data from multiple sources and includes quantitative attributes. (Reid and others, 2001). Currently, uSSEABED contains data for much of the U.S. continental shelves, and data are continously being added. 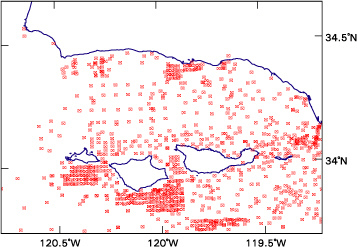 In this GIS, the uSSEABED data are provided as a point coverage.